This year marks 130 years since the first Brigidine Sisters arrived in Ararat on 14th November 1888. Ararat was and remains a centre of a large pastoral and agricultural district and has a history of gold mining in the area. The pioneer Sisters who generously volunteered to form the Ararat community and serve the people in that town were from two convents in Ireland. Three came from the Abbeyleix community ( Mothers Gertrude Kelly, Josephine Clancy and Paul Barron) and two from the Goresbridge community (Mother Cecilia Synnott and Sister Mary Malachy Byrne). On 25th November the Ararat parishioners will celebrate a special Eucharist and share a luncheon to mark 130 years of Brigidine life and ministry in Ararat. Today there is still a small community of Brigidine Sisters in Ararat and education in the Brigidine tradition continues in Marian College Ararat which was founded by Brigidines in 1889. 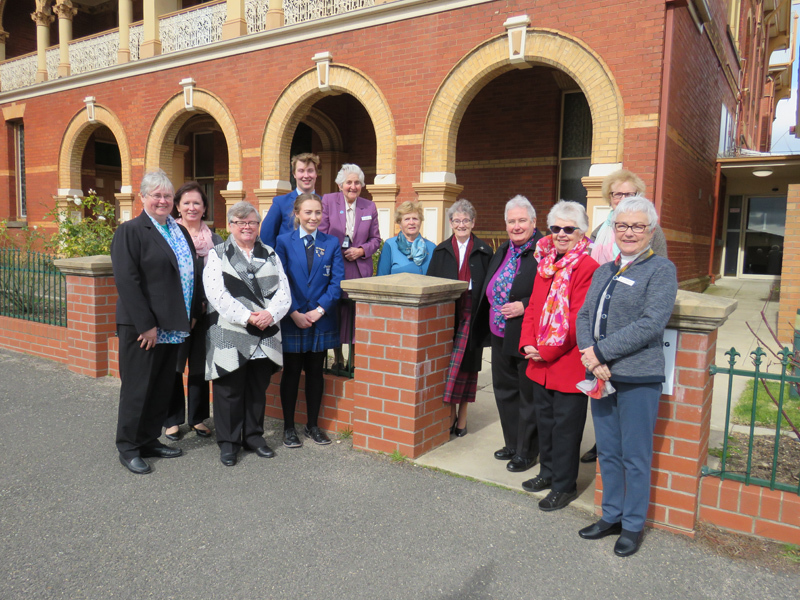 Brigidine Sisters and friends in front of the original Brigidine Convent. Since 1983 it has been used as part of Marian College.